The expensive, traditional OMR Sheet Reader Machines or OMR Scanners are required for OMR sheet scanning process. This is a false assumption. Specially designed, thick OMR answer sheets, meant for 2-colour printing must be purchased. This is also not true. OMR sheet scanning can be done using a regular image scanner. You no longer need to rely on expensive OMR sheet reader machines or OMR scanners, which also come with high maintenance costs. OMR sheet scanning can be done in black and white. 2-color prints are no longer needed. Regular printing papers that are 60-70 GSM in thickness can very well be used for printing OMR sheets. The process of OMR - Optical mark recognition has totally changed in last 10 years. Earlier expensive OMR sheet reader machines were used as OMR sheet readers. Now OMR sheet reading has become much simpler and economic. The role of OMR sheet checking machine is eliminated. Now the OMR sheet reader software is used as OMR sheet checker and OMR form reader. OMR sheet design is created using the OMR sheet design software. OMR sheet printing can be done using normal laser / inkjet printer or photocopy or offset printing. 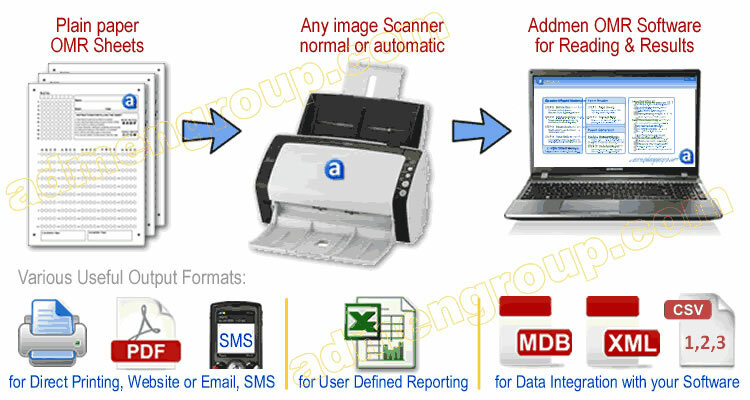 Any ADF scanner (Automatic scanning from pocket) can be used for OMR sheet scanning. Any regular flatbed scanner (1-by-1 sheet) can be used as an OMR sheet scanner. OMR software is the main component in the OMR sheet scanning process. Any OMR sheet format of your choice can be created by yourself using OMR form design software. This OMR form designer module is available in Addmen OMR sheet reader software. For OMR sheet printing, depending upon the quantity required, you can take laser prints, photo copies or offset prints on normal white paper. You don’t need any specifically designed OMR sheet printer. OMR sheet cost is negligible as you can design and print your OMR sheets yourself. In the new OMR sheet scanning software based process, the role of the OMR sheet scanner is just to scan the filled sheet. So you can use any flatbed scanner (1-by-1 sheet scanning) or ADF scanner (Automatic Document Feeder- many sheets in pocket). This eliminates the need for customized OMR Scanning machines. Choice of OMR scanner simply depends on the workload, the speed required, and your budget. If you already have a multi-function machine (print-scan-copy type) in your office, there is no need to buy the scanner; because the existing machine may also solve the purpose of scanning OMR sheets. Design your own OMR Sheet Many OMR sheet designs are ready made in the software.New designs can be made in any size using the Sheet Design Panel. Print your own OMR sheets: B/W Laser printouts on normal copier paper, Photocopies & Offset Printing all work well. Simplicity & Economy: Single black colour laser print is sufficient. 2-colour printing not essential. Thick paper not required. Regular copier can be used. Manual Sheet calibration is not required. Software automatically calibrates tilted and misaligned scans. OMR Pro can also read Old pattern OMR Machine based Sheets. Two sided sheets can be also be printed and processed. Work with any regular scanner: Use any brand, any model of the regular image scanner. Scanner and MCQ Test Checker Software are not linked. Scanning can be done on any PC. 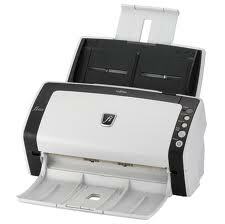 For Institutes (load of 2000 sheet/day): Cheapest ADF Scanner costs Rs. 7000/- and scans 10-12 sheets per minute. For professional work: Very high speed ADF scanners will cost you around Rs. 20000-40000/- approx. and will scan upto 40 sheets/min. High reading speed of 1 sheet/sec on an average PC and upto 3 sheet/sec on a well-configured PC. Single-pass reading of photo & data. Supports all patterns- MCQ, Numerical, True & False, Matrix matching type question. Negative & decimal marking. Section wise multiple marking schemes can be allotted. Announce the results via integrated SMS software. Upload Online OMR Test Result on Website. Free Backup facility on Secure Data Server.